This luxurious sixth floor corner unit is in “Esperia”, a high-rise condominium in the award-winning gated community of Bonita Bay. It has been designed as a resort styled facility with an enormous walk in infinity pool, cascading fountains and a screened club room with wet-bar, big screen TV and fireplace outdoors. The sprawling clubhouse provides you unlimited use of the health club with fully equipped fitness, locker, sauna and massage rooms. There is a theater room, library, billiard room, cigar patio and meeting rooms with catering kitchens and wet bars. Four guest suites are located poolside and are available for daily rental when you have additional visitors. The “Soft Contemporary” design, professionally decorated by the award-winning firm of Allen Kennedy, has an open floor plan. It has a sophisticated look, yet is very comfortable. You will marvel at the breathtaking view of the magnificent pool area with a backdrop of the Bay Island Golf Course, Estero Bay and the Gulf of Mexico beyond! The Living Room ensemble consists of a cushy five-seat sectional sofa and two sleek (but very comfortable) recliner chairs. Wrap-around windows are tastefully appointed with beautiful window treatments. Customized lighting creates the perfect mood at night. The entertainment unit has a High Definition LED Big Screen and Bose surround sound. Not to worry – the controls are a breeze to operate – switch from HD cable to a DVD movie or music via CD/IPod or FM with an easy to use remote control. A Gourmet Kitchen is the centerpiece for gathering. The inviting design features GE Monogram stainless steel appliances, custom cherry cabinets, granite countertops, a flat-panel LCD/DVD TV and a wine reserve. Comfortable seating is achieved at the wrap-around counter on five leather barstools. Customized lighting provides a warm glow in the evenings. The adjacent screened-in lanai has a built-in stainless grill and casual seating for eight with 180 degree views and soothing background sounds of the clubhouse fountains. The formal Dining Room seats eight and overlooks the ninth hole of the nationally ranked Bay Island Golf Course. The Master Suite features designer furnishings with a king sized bed, Vera Wang pillow-top mattress, 1000 thread-count bed linens and goose down pillows. Wake to magnificent western views of Estero Bay and the Gulf of Mexico through floor to ceiling windows. Step out on the open balcony with a view all the way to Sanibel Island to the North. The balcony comes with deep cushioned wicker furnishings including a two-person chaise lounge – it has an open-air feel yet is private enough for sunbathing “au natural”! This is a perfect spot for morning coffee or for enjoying romantic evening sunsets. The spacious Master Bath features an all glass oversized shower, Jacuzzi soaking tub, beautiful marble counters and custom cabinetry. His-and-her closets provide ample space for storage. The guest suite has a full bath and queen size bed with luxurious linens. There is ample room for an air-bed (included) to sleep grandchildren. As with the master suite, a Sharp Aquos flat-panel LCD TV (with built-in DVD) is mounted on the wall. The walk-in closet is spacious. The attached full bath has a tiled walk-in shower. The third bedroom has top-of-the-line oversized twin beds (even our ex-football player friends are comfortable on them!). The custom headboards are designed so that the beds can be combined with a special mattress pad to create another king bed if necessary. The room is spacious enough to accommodate the home office workspace (desk/bookcase/printer/fax). Catch up on work at the desk or take your laptop anywhere in the home with included WiFi service. Indoor parking offers two parking spaces, conveniently located directly across from the door to the lobby, and only a few steps from the elevators. Building management oversees an office in the lobby as well as in the clubhouse area and is available to accept packages and provide a variety of concierge-type services. Professional security is provided as well. Bonita Bay offers three waterfront recreational areas available to enjoy the outdoors. Spring Creek features canoe and kayak launches and picnic areas. Riverwalk Park offers lighted tennis courts, fishing piers, children's playground and a 12-station cardiovascular exercise area on Imperial River. Estero Park offers a pavilion, picnic area, butterfly park, and boardwalk to Estero Bay. A private Beach Club can be accessed by tram provided by Bonita Bay. Beach Club provides lounge chairs, restroom/showers, charcoal grills, and gazebo with picnic tables. Food and beverage concessions are offered in high-season. Marine charter services operate out of the Bonita Bay Marina, just a few minutes from your door offering private boats for sightseeing, sunset cruises and fishing charters (@ 239-566-6510). You’ll enjoy unrestricted accessibility to this challenging Audubon facility throughout the year with discounted green fees. Spend your vacation in this luxury condominium and live in the lap of luxury. 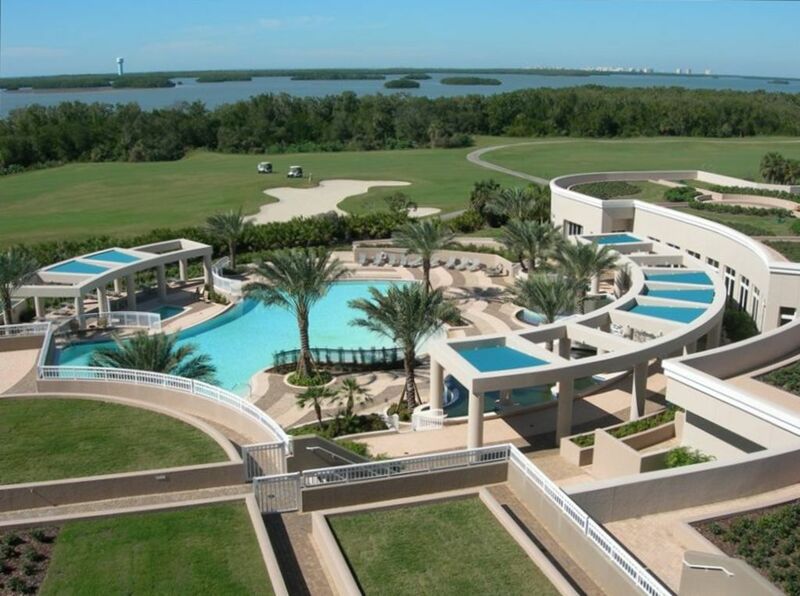 Enjoy the finest amenities available in Southwest Florida at your disposal. Renters are required by home owners association to submit application for lease and for a background security check. Fee is $137.00 per adult tenant for the background check. Dual zone - individual controls for the East facing bedrooms and West facing Great Room area/Master Suite. Luxury linens throughout - 1,000 count bed linens for Master Suite. Free "Rental on Demand" feature included with HD cable package. There are hundreds of movies at your fingertip. PLEASE NOTE: County and State taxes are displayed to reflect the correct combined taxable amount of 11%. Rental period for more than 180 days are not subject to tax. Absolutely NO pets allowed / NO smoking allowed.